By: Shawn C Baker on 25/05/2014. Good lord. Rarely do I buy a comic book because of the art, but in the case of Steve Niles and Bernie Wrightson’s Frankenstein Alive, Alive!, that was exactly the factor that catalyzed the purchase. While stalking the shelves of The Comic Bug during the sheer mayhem of Free Comic Book day earlier in the month (see the tail end of the latest issue of Drinking with Comics for a glimpse of the bedlam in the isles that day) this book jumped out at me from across the room and I quickly snared one of the two remaining copies. It has one of those pantone black covers so I had to sandwich it between Southern Bastards #1 and Deadly Class #4 so as not to decorate its beautiful visage with my fingerprints, and once I got it home I actually achieved a new level of nerd when I waited until I could procure some gloves from work in order to handle it enough to actually read the thing. Extreme? Yeah, maybe. But Wrightson’s a genius and a legend and this… this is some of the most gorgeous comic book art I have ever seen. And, as you may have noticed if you read this column regularly, I’ve seen an awful lot of comic book art. 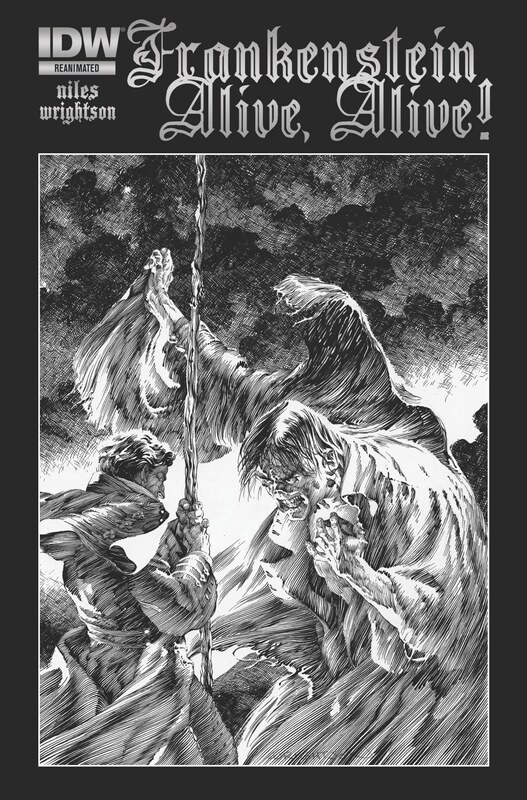 Now, let me get this little confessional bit out of the way up front: I am completely unfamiliar with Mr. Wrightson’s 1983 book Bernie Wrightson’s Frankenstein, which is an adaptation of Mary Shelley’s classic novel and which Alive, Alive! is a sequel to. My own negligence to the original adaptation is soon to be remedied, however in the interim I could not help but begin reading the sequel. And what I found is Alive, Alive! does indeed function as enough of a self-contained story that it should not dissuade new readers who might want to seek it out. At this point in our culture Shelley’s novel is essentially archetypal, and barring anyone who might not be at all familiar with the story at all, even the most basic understanding of the legend of Dr. Frankenstein’s creation should put potential readers in a position to appreciate where this new story begins. I’ll admit, ever since I was in the single digits I’ve had a bit of a thing for Frank, and although I haven’t read Shelley’s tale in probably over twenty years – another bit of negligence soon to be remedied – I’ve always loved the story, the characters and the prospect of a continuation. I’ve heard people talk up Dean Koontz’s Frankenstein novels but… no. Nothing against Mr. Koontz, but from what I know of that story, I’m not interested. This however, what Mr. Niles and Mr. Wrightson have done, it is just perfect. I don’t want to go into plot points other than to say Frankenstein Alive, Alive! does indeed pick up as a direct sequel to the original tale. My intention with this article is more to raise awareness of the book because I feel as though it was only by chance that I happened to stumble upon it now, right before the long-awaited third issue hit the stands. I’m sure there’s a host of comic book readers and Frankenstein fans out there who do not even know this exists and that my friends, is a shame. The book I purchased on FCBD – Frankenstein Alive, Alive! Reanimated Edition – turned out to be a combined reissue of the first two installments of this series, issues that actually came out in 2013. Issue #3 hit the stands shortly thereafter and I have to warn you, there appears to be a lower print run on these, so if you’re interested grab it as soon as possible and have your local shop throw it on your pull. I’ve never been one to read a book strictly for the art, and I definitely don’t want it to sound as though I am downplaying Mr. Niles’ contributions. Credited with script and co-plotting I can’t think of a better collaborator for this book. However, this is Bernie Wrightson’s show and for someone like myself, who usually perceives the art in comics as essentially visual story cues, I could stare at any of these pages for hours and just sigh in awe. Now, how long until issue #4? One Response to Thee Comic Column #86: Frankenstein Alive, Alive! 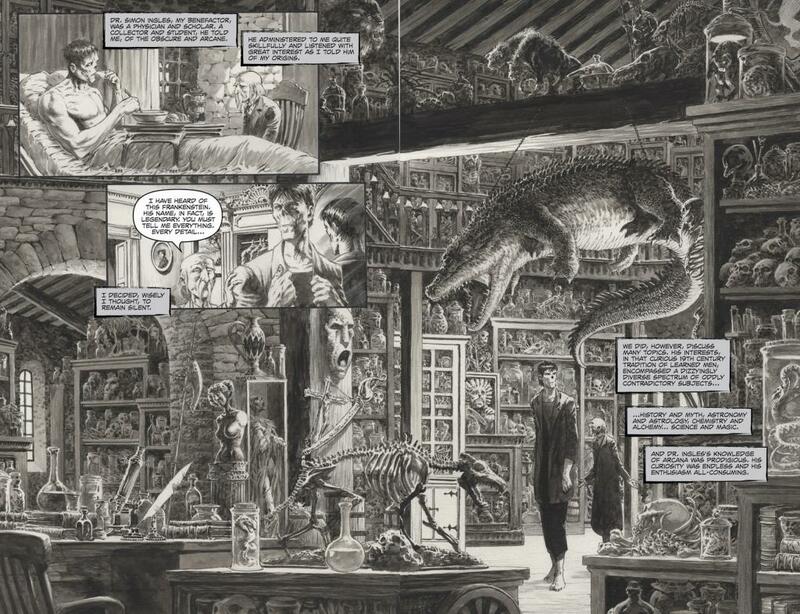 Wrightson’s art belongs on walls…it’s stunning.